Will Artificial Intelligence Mean Massive Job Loss? In the late 1970s, my early years at the University of Massachusetts Boston (UMB), the Department of Economics had two secretaries. When I retired, in 2008, the number of faculty members and students in the department had increased, but there was only one secretary. All the faculty members had their own computers, with which they did much of the work that secretaries had previously done. I would guess that over those thirty years, the number of departmental secretaries and other secretaries in the university declined by as many as 100, replaced by information technology—what has now become the foundation of artificial intelligence. As I started writing this column, however, I looked on the university’s web site and counted about 100 people with jobs in various parts of the Information Technology Department. Neither this department nor those jobs existed in my early years at UMB. The advance in technology that eliminated so many secretaries also created as many jobs as it eliminated—perhaps more. My little example parallels the larger and more widely cited changes on U.S. farms in the 20th century—a century when the diesel engine, artificial fertilizers, and other products of industry reduced the percentage of the labor force working on farms from 40% to 2%. No massive unemployment resulted (though a lot of horses, mules, and oxen did lose their jobs). The great expansion of urban industrial production along with the growth of the service sector created employment that balanced the displacement of workers on the farms. Other cases are cited in debates over the impact of artificial intelligence, examples ranging from handloom weavers’ resistance to new machinery in the early stages of the Industrial Revolution to a widespread concern about “automation” in the 1960s. Generally, however, the new technologies, while displacing workers in some realms of production, also raised productivity and economic growth. There has, as a result, been increased demand for old products and demand for new products, creating more and different jobs. Historically, it seems, each time prophecies foretold massive unemployment resulting from major technological innovations, they turned out to be wrong. Indeed, often the same forces that threatened existing jobs created new jobs. The transitions were traumatic and harmful for the people losing their jobs, but massive unemployment was not the consequence. Today, as we move further into the 21st century, many people are arguing that artificial intelligence—sophisticated robotics—is different from past technological shifts, will replace human labor of virtually all types, and could generate massive unemployment. Are things really different this time? Just because someone, once again, walks around with a sign saying, “The world is about end,” doesn’t mean the world really isn’t about to end! In much of modern history, the substitution of machines for people has involved physical labor. That was the case with handloom weavers in the early 19th century and is a phenomenon we all take for granted when we observe heavy machinery, instead of hand labor, on construction sites. Even as robotics entered industry, as on automobile assembly lines, the robots were doing tasks that had previously been done with human physical labor. “Robotics” today, however, involves much more than the operation of traditional robots, the machines that simulate human physical labor. 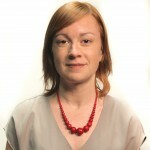 Robots now are rapidly approaching the ability, if they do not already have it, to learn from experience, respond to changes in situations, compare, compute, read, hear, smell, and make extremely rapid adjustments (“decisions”) in their actions—which can include everything from moving boxes to parsing data. In part, these capabilities are results of the extreme progress in the speed and memory capacity of computers. They are also the result of the emergence of “Cloud Robotics” and “Deep Learning.” In Cloud Robotics, each robot gathers information and experiences from other robots via “the cloud” and thus learns more and does so more quickly. Deep Learning involves a set of software that is designed to simulate the human neocortex, the part of the brain where thinking takes place. The software (also often cloud-based) recognizes patterns—sounds, images, and other data—and, in effect, learns. While individual robots—like traditional machines—are often designed for special tasks, the basic robot capabilities are applicable to a broad variety of activities. Thus, as they are developed to the point of practical application, they can be brought into a wide variety of activities during the same period. Moreover, according to those who believe “this time is different,” that period of transition is close at hand and could be very short. The disruption of human labor across the economy would happen virtually all at once, so adjustments would be difficult—thus, the specter of massive unemployment. People under thirty may take much of what is happening with information technology (including artificial intelligence) for granted, but those of us who are older find the changes awe-inspiring. Nonetheless, I am persuaded by historical experience and remain skeptical about the likelihood of massive unemployment. Moreover, although big changes are coming rapidly in the laboratories, their practical applications across multiple industries will take time. Even if my skepticism is warranted, the advent of the era of artificial intelligence will create real problems, perhaps worse than in earlier eras. Most obvious, even when society in general (on average) gains, there are always losers from economic change. Workers who get replaced by robots may not be the ones who find jobs in new or expanding activity elsewhere. And, as has been the case for workers who lost their jobs in the Great Recession, those who succeed in finding new jobs often do so only with lower wages. More broadly, there is the question of how artificial intelligence will affect the distribution of income. However intelligent robots may be, they are still machines which, like slaves, have owners (whether owners of physical hardware, patents on the machines, or copyrights on the software). Will the owners be able to reap the lion’s share of the gains that come with the rising productivity of this major innovation? In the context of the extremely high degree of inequality that now exists as artificial intelligence is coming online, there is good reason for concern. As has been the case with the information technology innovations that have already taken place—Microsoft, Apple, Google, and Facebook leap to mind—highly educated or specially skilled (or just lucky) workers are likely to share some of the gains from artificial intelligence. But with the great inequalities that exist in the U.S. educational system, the gains of a small group of elite workers would be unlikely to dampen the trend toward greater income inequality. Over the long run, technological improvements that generate greater productivity have yielded some widely shared benefits. In the United States and other high-income countries, workers’ real incomes have risen substantially since the dawn of the Industrial Revolution. Moreover, a significant part of the gains for workers has come in the form of an increase in leisure time. Rising productivity from artificial intelligence holds out the possibility, in spite of the trends of recent decades, for a shift away from consumerism towards a resumption of the long-term trend toward more leisure—and, I would venture, more pleasant lives. So even though I’m skeptical that artificial intelligence will generate massive unemployment, I fear that it may reinforce, and perhaps increase, economic inequality. This article originally appeared at dollarsandsense.org on September 29, 2016. Reprinted with permission. 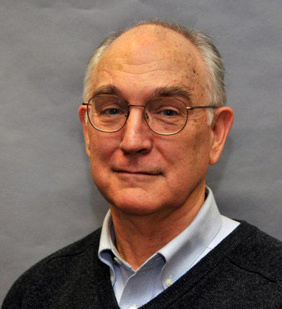 Arthur Macewan is professor emeritus of economics at UMass-Boston and a Dollars & Sense Associate. While this is the first strike at a Just Born facility in decades, this is not the first time the company has attempted to impose a change in pension plans, according to union officials. Last year, the company implemented a final contract including the same 401(k) plan proposed at the Bethlehem plant, after declaring an impasse in its contract negotiations with the roughly 35 workers at its Goldenberg’s Peanut Chews factory in Philadelphia. 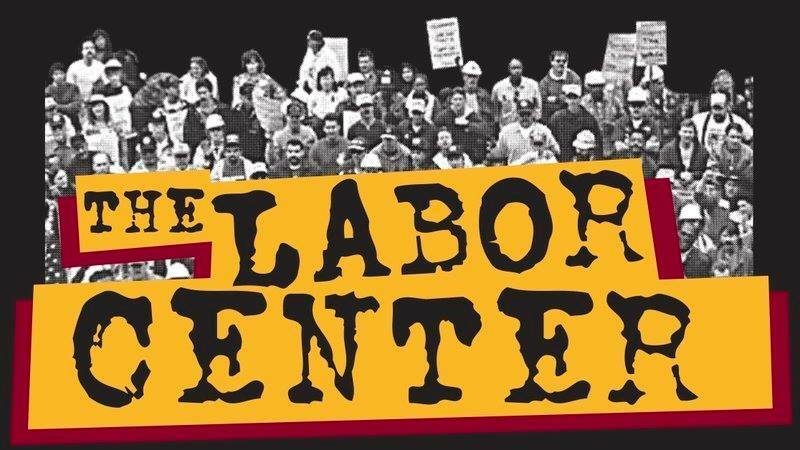 BCTGM challenged the change with the National Labor Relations Board but was denied, leading the union to take the matter to federal court in a case that is still pending, a year and a half later. This blog originally appeared at inthesetimes.com on September 27, 2016. Reprinted with permission. On Wednesday, the Federal Reserve’s open market committee concluded its two-day meeting to set U.S. monetary policy. In a vote that divided the Board of Governors, appointed by the president and confirmed by the U.S. Senate in an open public process, and the presidents of the regional bank board presidents, chosen by boards dominated by banks within their region, Janet Yellen, chair of the Federal Reserve Board of Governors and the FOMC, announced the FOMC decided to hold steady to its current Fed funds rate. The Fed funds rate is an overnight interest charge made between banks loaning reserves to each other. If it is higher, the cost of making loans goes up, and that reduces liquidity for the business and consumer sectors. Lower liquidity means less borrowing for business investment or consumer purchases like homes and cars. In turn, that means slower demand, and translates into slower growth for jobs. Last December, after a long period of keeping the Fed funds rate near zero, the FOMC voted unanimouslyto raise the Fed funds rate by one-quarter to one-half points. It was anticipated that would be the first in a series of increases of similar small amounts. But, over the course of this year, the economy has run rather flat. Employment in the areas sensitive to interest rates like construction and manufacturing, after employment gains during 2015, ran flat. Durable goods manufacturing, which had been declining during 2015, continued to fall. In 2015, the unemployment rate fell from 5.7% in January to 5.0% in October. It has since remained stuck at about that level. Ideally, when the Federal Reserve gets things right, the economy runs neither too hot or too cold. Eight months of flat unemployment rates and tepid GDP growth would suggest the Fed has clearly succeeded in finding a landing that, so far hasn’t meant crashing the economy. At least, on Wednesday, the evidence from modest GDP growth, flat unemployment and very low inflation convinced the six Board of Governors and the president of the New York Federal Reserve Regional Bank to hold steady; a tribute to Janet Yellen’s leadership to stay focused on the data and the real economy. But, the other three regional bank presidents, Esther George of Kansas City, Loretta Mester of Cleveland and Eric Rosengren of Boston, all voted to raise the rate now. Another point of context is understanding the global economy is growing slower. The other major world economies, Europe, Japan and China, are struggling with slow growth. Their central banks are operating with either zero or negative interest rates. America’s modest growth looks very good next to their anemic performance. So this is making the dollar very strong. And that helps to explain the weakness of U.S. manufacturing because a strong dollar hurts U.S. exports. So even modest increases in U.S. interest rates are big by global standards and could further disadvantage U.S. manufacturing. A second context is that the excess level of savings, globally, is chasing down projections of interest rate levels. Currently, the consensus at the Fed is that in the midterm, the Fed funds rate is likely to be around 1.9% at the end of 2018, and in the long run the normal rate is expected to be about 2.9%. On the eve of the Great Recession, the Fed funds rate was 5.25%. Compared to 2.9%, a raise to between one-half and three-quarters is not small. It isn’t like when the “normal” rate was above 5%. The current tension in the FOMC between the Board of Governors and the regional bank presidents continues the controversy whether banks have too much say. Independence of the Fed from the political process is important. But, so too is Fed independence from the banks they need to regulate and oversee to make sure we have economic stability. The vote from Wall Street was positive. The stock market gains show a consensus the Fed is doing it right. This blog originally appeared in aflcio.org on September 23, 2016. Reprinted with permission. William E. Spriggs serves as Chief Economist to the AFL-CIO, and is a professor in, and former Chair of, the Department of Economics at Howard University. Follow Spriggs on Twitter: @WSpriggs. The American Federation of Labor and Congress of Industrial Organizations (AFL-CIO) came out this week in support of the Dakota Access Pipeline, the construction of which was delayed last week by an order from the Obama administration—a decision that itself stemmed from months of protests led by the Standing Rock Sioux. But it “is fundamentally unfair,” he added, “to hold union members’ livelihoods and their families’ financial security hostage to endless delay. The Dakota Access Pipeline is providing over 4,500 high-quality, family supporting jobs. But an old blue-green mantra says, “there are no jobs on a dead planet.” The parts of organized labor that have taken that phrase to heart are far from unified around Trumka’s DAPL backing—even within the AFL-CIO. National Nurses United (NNU) has had members on the ground at Standing Rock protests and others around the country have participated in a national day of action. “Nurses understand the need for quality jobs while also taking strong action to address the climate crisis and respecting the sovereign rights of First Nation people,” said RoseAnn DeMoro, NNU’s executive director and a national vice president of the AFL-CIO. In response to the federation’s endorsement, DeMoro cited the work of economist Robert Pollin, who found that spending on renewable energy creates approximately three times as many jobs as the same spending on maintaining the fossil fuel sector. Unions like the Amalgamated Transit Union and the United Electrical Workers have each issued similar statements supporting protests against the pipeline, and calling on the Obama administration to step in and block the project permanently. For those who follow labor and the environment, however, the above unions might be familiar names. Many were vocal advocates for a stronger climate deal in Paris, and sent members to COP21 at the end of last year. They were also those most vehemently opposed to the Keystone XL pipeline, and all supported Bernie Sanders’ primary campaign against Hillary Clinton. While friendly to progressives, these unions have tended to have a relatively limited impact on bigger unions, like the American Federation of Teachers and the American Federation of State, County and Municipal Employees (AFSCME). According to Sean Sweeney, though, this small group of unions might now be gaining strength. “Progressive unions are becoming a more coherent force,” he told In These Times. Sweeney helped found a project called Trade Unions for Energy Democracy, which works with unions around the world on climate change and the transition away from fossil fuels, including the National Education Association and Service Employees International Union (SEIU) Local 32BJ in the United States. He also runs the International Program for Labor, Climate and the Environment at City University of New York’s Murphy Institute. Between Trumka’s DAPL endorsement and the Fraternal Order of Police’s endorsement of Donald Trump for president, this week has shown a stark divide between parts of American labor and today’s social movements. Progressive unions face an uphill battle on many issues, within and outside of organized labor. 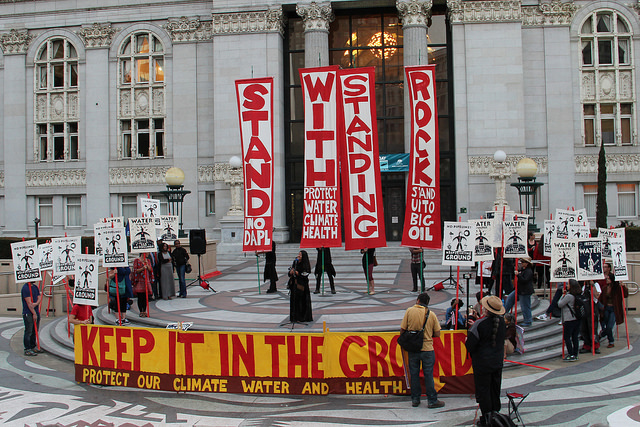 The question now—on the Dakota Access Pipeline—is whether today’s “Keystone moment” can break new ground in the jobs versus environment debate. Another day, another scandal at the big banks. Since the financial crisis, banks like Barclays and UBS have been caught manipulating interest rates; J.P. Morgan has reluctantly handed over billions for its association with Bernie Madoff, illegal hiring practices, and lax oversight of its own traders among its other misdeeds; while Goldman Sachs has been fined billions for selling toxic subprime mortgages to investors. This past week the Consumer Financial Protection Bureau (CFPB) fined Wells Fargo $185 million for creating fake accounts and assigning them to unwitting customers. While this outrage shows the need for tighter regulation, it also exposes the urgent need to end the anti-consumer practice of forced arbitration in financial service agreements. If consumers cannot access the courts, scandals will be harder to uncover and victims will find it nearly impossible to achieve justice. Over the last decade, Wells Fargo has pioneered a business strategy called “cross-selling.” The idea is to get customers to use other products sold by the bank. If you have a checking account, try out a credit card. If you like our investment services, why not get a mortgage? High level managers bullied subordinates into hitting impossible account-creation targets. The result was massive fraud: according to the CFPB, Wells Fargo opened 1,534,280 deposit accounts and 565,443 credit-card accounts “that may not have been authorized, by using consumers’ information without their knowledge or consent.” More than 100,000 of these accounts were charged fees: in other words, Wells Fargo customers paid late fees for accounts they never opened and never wanted. The scope of the scandal is breathtaking. Wells Fargo has already fired more than 5,300 employees and the victims of its illegal scheme likely number in the hundreds of thousands. On its face, this would seem the perfect instance for a class action lawsuit (in which similarly situated plaintiffs come together to bring a lawsuit). 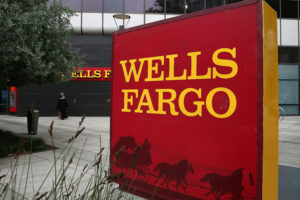 Wells Fargo, however, has a notoriously stringent arbitration agreement. Instead of allowing those who have a “disagreement” with the company to bring a lawsuit, they force them into an out-of-court arbitration. Arbitrators aren’t required to follow precedent, nor do they abide by encoded rules of procedure. They can make their decisions on a whim and without a hearing, and these rulings cannot be appealed. Their income depends on being rehired by the companies themselves. Studies consistently show that arbitrators favor their corporate benefactors. This is unsurprising: corporations wouldn’t be rushing to write new forced arbitration agreements if this alternative system was more likely to favor the consumer. Noting the stark language of the agreement, federal Judge Vincent Chhabria found that the agreement was broad enough to cover any dispute between the bank and its clients, thus denying defrauded clients access to the courts. Never mind that consumers can hardly agree to anything with regard to accounts they never opened or desired in the first place. Federal agencies are taking steps to curb the use of forced arbitration. The CFPB has released a proposed rule that would prohibit class action bans in arbitration clauses, while the Department of Education is considering similar provisions in education contracts (for-profit colleges are infamous for their iron clad mandatory arbitration clauses). President Obama has signed an Executive Order granting the Labor Department authority to prohibit companies with federal contracts of more than $1 million from enforcing such clauses. The Department of Defense, having seen the unfairness of forced arbitration on our men and women in uniform, has prohibited forced arbitration in credit cards and auto loans to service members. These steps, if finalized, will not only help ensure justice for those already wronged, but prevent future scandals. If wrongdoing is exposed before a public court of law instead of behind closed doors, corporations will be less likely to cheat their customers. And if companies must confront an impartial judge and jury, wronged consumers are much more likely to win relief. Ending forced arbitration would not only help the victims of this Wells Fargo scandal, it may prevent the next one. This blog originally appeared in afj.org on September 20, 2016. Reprinted with permission. 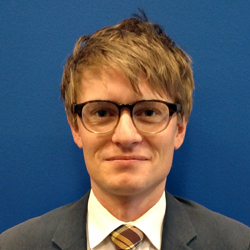 Aaron Jordan serves as a Dorot legal fellow at Alliance for Justice. As a member of the Justice program, he works on and writes about judicial nominations, the Supreme Court, and the civil justice system. Aaron received his B.A. in History from Davidson College and his J.D. from the University of Pennsylvania Law School. At Penn, Aaron was the Articles Editor for the Journal of International Law, a Project Coordinator for the International Human Rights Advocates, and a Teaching Assistant in Constitutional Law for Professor Rogers Smith. 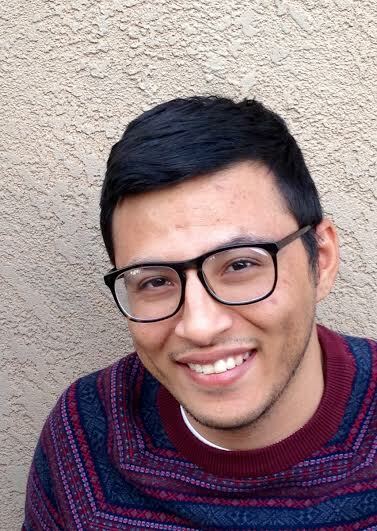 During law school, Aaron had internships for the organizations Voices on the Border and Human Rights First, and worked as a law clerk for Congressman Gregory Meeks (D-NY) and Senator Patrick Leahy (D-VT). After graduating from college, Aaron spent a year teaching in Honduras, where he started an ongoing scholarship to fund the education of deserving, underprivileged children. More than 570 Boulder Station workers will now enjoy and exercise their right to come together and make things better at their workplace with the Culinary Workers Union Local 226 and the Bartenders Union Local 165. Boulder Station is the first of Station Casinos’ properties in Nevada to vote yes for unionization. At the large casino-hotels owned and operated by Station Casinos in Las Vegas, including the soon-to-be-acquired Palms Casino Resort, workers have been publicly demanding a fair process to exercise their right to choose whether to form a union. Station Casinos responded with a vicious anti-union campaign.Despite the attacks, the working people of Boulder Station came together. In the recent environment of heightened anti-immigrant sentiment spewing from those vying for the highest offices, while also embroiled in concurrent battles with unions of working people, it’s great to see workers stand up and join forces with the Culinary Workers Union. 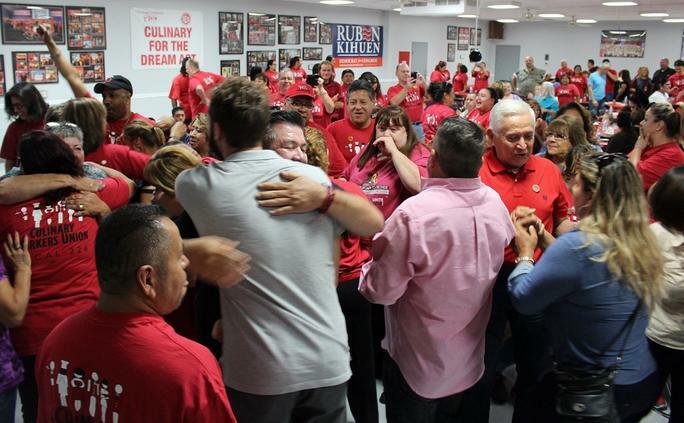 The Culinary Workers Union is Nevada’s largest immigrant organization with more than 57,000 members—a diverse membership that represents just over 50% Latino workers, as well as a membership of about 50% women. Members—who work as guest room attendants, bartenders, cocktail and food servers, porters, bellmen, cooks and kitchen workers—come from 167 countries and speak more than 40 different languages. The hardest fought battles can yield the sweetest victories—a bolder #UnionYes and the power of a union to keep fighting for what you deserve. 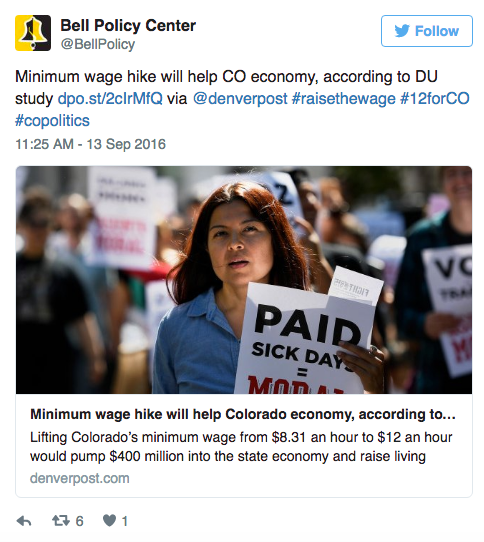 This blog originally appeared in aflcio.org on September 16, 2016. Reprinted with permission. 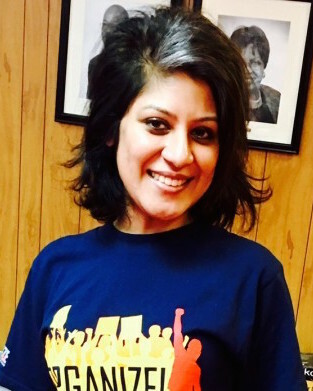 Sonia Huq is the Organizing Field Communications Assistant at the AFL-CIO. She grew up in a Bangladeshi-American family in Boca Raton, Florida where she first learned a model of service based on serving a connected immigrant cultural community. After graduating from the University of Florida, Sonia served in the AmeriCorps National Civilian Community Corps and later worked for Manavi, the first South Asian women’s rights organization in the United States. She then earned her Master’s in Public Policy from the George Washington University and was awarded a Women’s Policy Inc. fellowship for women in public policy to work as a legislative fellow in the office of Representative Debbie Wasserman (FL-23). Sonia is passionate about working towards a more just society and hopes to highlight social justice issues and movements through her writing. Courts have an important responsibility to approve class action settlements and ensure that the plaintiffs and their attorneys are not selling out the class by colluding with the defendants. Sometimes, though, in their zealous protection of the absent class members, courts wind up forgetting the old aphorism attributed to Confucius: “Better a diamond with a flaw than a pebble without.” Uber drivers may wind up with pebbles rather than somewhat flawed diamonds. 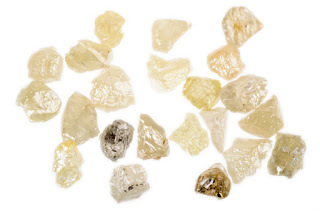 Crushed pebbles may make concrete, but even flawed diamonds could help pay a lot more bills. When veteran wage-and-hour litigator Shannon Liss-Riordan sought court approval for a $100 million settlement on behalf of a class of 385,000 Uber drivers in California and Massachusetts, she was denounced by some objectors for the compromise she reached, even after she volunteered to cut her fee in half. Then Judge Edward Chen of the U.S. District Court for the Northern District of California last month denied approval of the proposed settlement of the drivers’ independent-contractor-misclassification claims, finding that the settlement was not “fair, adequate, and reasonable,” as required to grant preliminary approval. Judge Chen is one of the most careful protectors of absent class members and one of the most thoughtful jurists when it comes to adjudicating wage protections. In denying preliminary approval for the proposed independent-contractor-misclassification settlement, Judge Chen expressly endorsed the view that district court review of class action settlements should not be too lax – and particularly that the court’s review at the preliminary (as opposed to the final) approval stage should be more searching. But, in this case, his decision disapproving the settlement may have unintended consequences. In disapproving the settlement, Judge Chen acknowledged the risk posed by Uber’s previously-rejected arbitration provisions, stating: “The most obvious risk to Plaintiffs is, of course, that the Ninth Circuit [which sits as the Northern District of California’s reviewing court] will uphold the validity of the arbitration provision contained in the 2013 and/or 2014 agreements, which this Court found was invalid as a matter of public policy.” This is exactly what happened. Last week’s decision from the Ninth Circuit upholding Uber’s arbitration agreements (which contained class waivers) in another case may mean that the vast majority of those 385,000 drivers will get nothing. The Ninth Circuit ruled that Judge Chen had erred in previously declaring Uber’s arbitration agreements unenforceable, and that in doing so, he had “ignore[d]” circuit precedent. Now, to get anything at all, each driver may need to bring an individual arbitration against Uber and win, showing that he or she was more like an Uber employee than an independent contractor. This will be a tough showing and, as Uber well knows, the vast majority of drivers will never step forward to assert the risky claims at all. Denying approval for the $100 million settlement, Judge Chen found that the settlement reflected a 90% discount on the full value of the drivers claims, with the exception of the claim under the Private Attorneys General Act (PAGA), for which the Court indicated that the settlement was a mere 0.1% of their full value. In particular, Judge Chen expressed concern that the PAGA claim had recently been added to the lawsuit to induce Uber to settle. 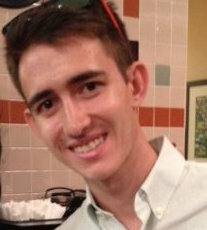 Furthermore, Judge Chen questioned the value of the nonmonetary relief in the settlement, such as the provision that would allow drivers to accept cash tips (as opposed to in-app tipping as with Lyft), suggesting that riders accustomed to a cashless experience are unlikely to reach for their wallets. It is possible that each of these terms was a compromise that was less than ideal for the Uber driver class members. 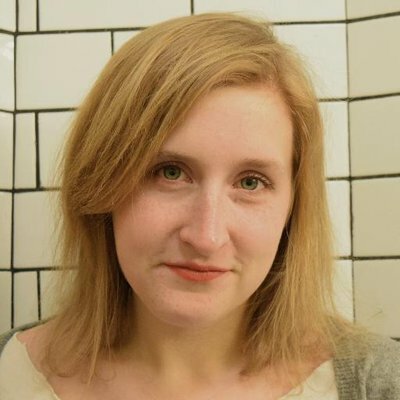 Of course, any settlement of a wage-and-hour class action (or more broadly, any settlement of any lawsuit) is going to consist of a mix of terms, both good and bad for both sides of the dispute. But surely getting some money in a settlement – even an imperfect settlement – would be much better for hundreds of thousands of Uber drivers than getting nothing at all. These Uber disputes raise central questions about the level of scrutiny a district court should apply to a class settlement – particularly given Judge Chen’s criticism of “lax review” – and whether the Court or class counsel is in a better position to evaluate the risks of non-recovery. While the court is charged with preventing collusive settlements to protect absent class members, ultimately, seasoned and responsible class counsel and class members both tend to care most about the bottom line, in light of the risks. With the benefit of hindsight, Liss-Riordan appears to have been right about the risks of proceeding with the litigation, and the settlement’s objectors were misguided. The case is not over. Liss-Riordan has been signing up Uber drivers to pursue individual arbitrations in California. The PAGA claims on behalf of California drivers may not be compelled to arbitration. Nonetheless, the likelihood of a recovery nearing $100 million, or getting money for all 385,000 Uber drivers, looks bleak. When reviewing class action settlements that were negotiated at arm’s length by experienced class counsel, where class counsel is able to articulate the rationale for their position, courts should be hesitant to second-guess counsel’s risk assessment. The perfect is often the enemy of the good in these cases, where a court – with a single decision – can erase years of work to obtain a successful result, absent some kind of an agreement between the parties. Particularly in the employment context, where workers should be recovering more than nominal amounts in any class resolution, those who do not wish to participate can always opt-out of a deal and pursue their own claims if they are so inclined. For the rest, though, receiving flawed diamonds might be a whole lot better than the alternative – getting dirt. This blog appeared on Bryan Schwartz Law on September 16, 2016. Reprinted with permission. Logan Starr is an associate at Bryan Schwartz Law, focusing on employment discrimination, whistleblower, and wage-and-hour claims. Previously, Mr. Starr served two years as a law clerk to the Honorable L. Patrick Auld, United States Magistrate Judge for the Middle District of North Carolina. Bryan Schwartz Law is an Oakland, California-based law firm dedicated to helping employees protect their rights in the workplace. Mr. Schwartz and his firm have fought to prohibit discrimination, retaliation, and harassment obtained reasonable accommodation for disabled employees, vindicated whistleblowers’ rights and ensured that corporations pay workers all wages they are owed. Bryan Schwartz Law has successfully litigated individual and class action complaints nationwide, helping to recover millions of dollars for thousands of employees, forcing corporations and Government agencies to change their practices and punish wrongdoers. 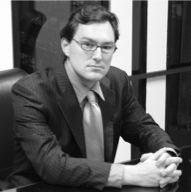 Bryan Schwartz Law is also one of the few Bay Area-based law firms with extensive experience representing Federal employees in their unique Merit Systems Protection Board and Equal Employment Opportunity Commission complaints. The average woman who had a full-time, year-round job in 2015 made just 80 percent of what a man did, according to the latest data from the Census Bureau. That’s up from last year’s 79 percent, but the increase is not statistically significant. The wage gap hasn’t closed significantly since 2007. 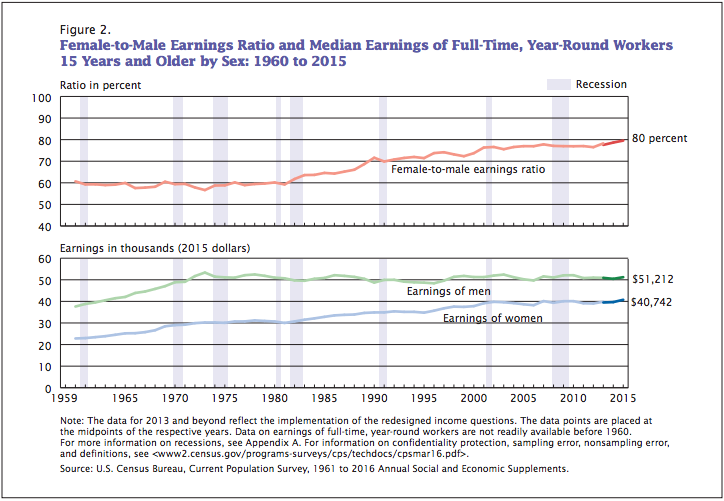 In 2015, men made $51,212 at the median, compared to $40,742 for women, a $10,470 difference. Both experienced an increase in income—1.5 percent for men and 2.7 percent for women—the first significant raise since 2009. There are a number of factors that go into the gender wage gap. About 20 percent of it is due to the fact that women often end up in jobs and industries that pay less. Occupations with large numbers of women pay about 83 percent as those with large numbers of men. It’s not just that women choose to be in lower paid work; when a large number of women start to enter a job that was previously held by men, the pay drops. Another portion of the gap can be explained by the fact that women tend to interrupt their careers or cut back on their hours. They are much more likely than men to do this to care for family members, work that still falls mostly to them. Some may have little choice given how few supports, like paid family leave and affordable child care, the country offers them. But there is a sizable percentage of the gap between women’s and men’s earnings that can’t be explained by various factors—in one comprehensive study, about half of it. Women make less than men in every industry and in virtually every occupation. Even women with the exact same jobs as men earn less than them. Education can’t close the gap, as female college graduates make less in their first jobs than male ones even when they have the same grades, majors, and other credentials, and women make less than men at every educational level. There is evidence, however, that women and their work are justundervalued. This article was originally posted at Thinkprogress.org on September 13, 2016. Reprinted with permission. – A minimum wage worker in Arizona only earns $17,000 per year. – More than half of minimum wage workers in Arizona are women. 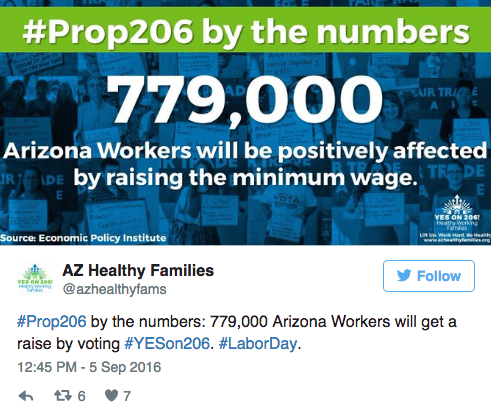 – More than 27 percent of Arizona’s low-wage earners are parents. 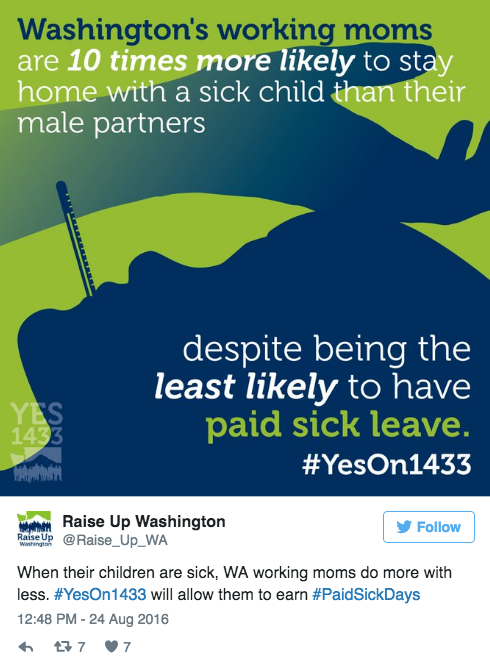 – 45 percent of Arizonans don’t have access to earned sick days. – In Maine, Question 2 will create an additional 3 percent tax surcharge on incomes exceeding $200,000 per year. The revenue from the increase will be earmarked to help fund K–12 public education. – In Howard County, Maryland, voters will decide if they want a citizen-funded campaign system, to boost the power of small, individual donations, and encourage more candidates to run without the burden of raising major funds. The initiative, Question A, is supported by Fair Elections Howard, Progressive Maryland, and other progressive organizations. This post originally appeared on ourfuture.org on September 15, 2016. Reprinted with Permission. Terrance Heath is the Online Producer at Campaign for America’s Future. He has consulted on blogging and social media consultant for a number of organizations and agencies. He is a prominent activist on LGBT and HIV/AIDS issues.